My favorite outfit from the 70’s. There is something you need to know about me: I LOVED this outfit. I wanted to be cool. 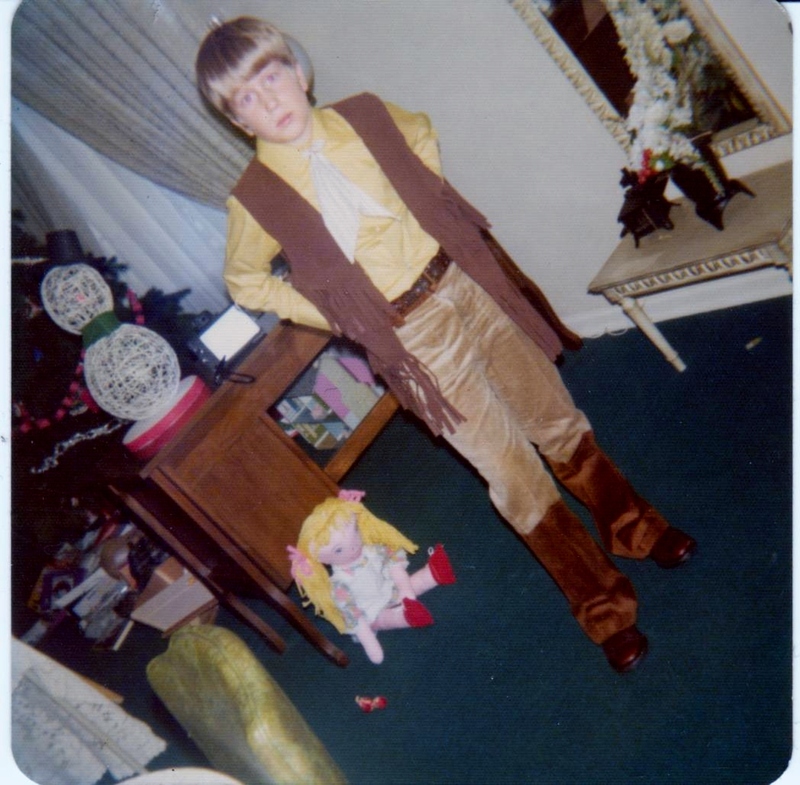 I wanted a leather vest with fringe, two-toned corduroy pants and a neckerchief tie. You didn’t get any cooler than this. It was pinnacle of my cool career. In fact, it’s been all down hill since then. I can’t answer any questions concerning the doll on the floor, the snowman made from string and glue, the small table under the mirror, or why the picture is taken on an angle. But I can tell you anything you want to know about that cool vest and the pants. I can tell you that the fringe dangling from the vest were slowly pulled from the beautiful garment, one or two at a time. They got pinched under my elbows, caught in books, shut in doors. And one day I looked at the vest and it was a pathetic image of its former self; a few pitiful strands hanging limply from the front and sides. I can tell you that the pants made me look like I was wearing cowboy boots that extended up my mid-calf. This was especially important to me as I was stuck wearing orthopedic shoes into my fifth year of school and the rounded toes of these expensive shoes caused me to stand out. My pigeon-toed feet needed correcting and my wardrobe suffered in an era when boys and men were wearing pointy-toed shoes and boots; a fashion statement of cool and I could not participate. I can tell you that I quickly lost the neckerchief. This was just asking for problems and I could see this clearly as soon as I put it on. I can also tell you that I’ve never had an outfit that was so cool, so perfectly put together and so life-changing. Today I shop at Goodwill and finding an outfit with this level of pizazz is quite a challenge. But don’t think I don’t look hard every time I’m in the store!